U.S. Senator Bill Nelson, D-Florida, said the Islamic State claimed responsibility for a mass shooting at an Orlando LGBT nightclub that left 49 dead and 53 injured, the deadliest shooting in American history. The killer, Omar Mateen, called 911 moments before the attack and pledged his allegiance to Islamic State, a federal law enforcement official said, confirming earlier reports. The gunman legally purchased the firearms in Florida within the last week, said the Bureau of Alcohol, Tobacco, Firearms and Explosives. Mateen, 29, is an American citizen born in New York. The FBI first became aware of him in 2013. It has been clarified that there is not a second suspect being searched for. The 11 officers involved in the shooting are on leave, as is standard in officer-involved shootings. There will be a moment of silence tonight at 6 p.m. EST for the Pulse shooting victims. President Barack Obama delivered a statement on the shooting Sunday afternoon. “We know enough to say this was an act of terror and an act of hate,” Obama said in his statement. The president said authorities have not reached a conclusion on the killer’s motives, and it’s still unclear how a terrorist group inspired the shooting. Watch the full statement below. Because of an overwhelming turnout of people wanting to donate blood to victims of the Pulse nightclub shooting, OneBlood is asking donors to stop coming Sunday and schedule appointments over the next few days. Police are still focused on identifying the many victims and notifying their families. Family members are urged to call city's crisis hotline at 407-246-4357. More details have emerged on the suspect, Omar Mateen, who died at the scene. According to the Orlando Sentinel, Mateen was a security guard licensed by the state of Florida to carry a firearm, state records show. Multiple media outlets also are reporting the shooter called 911, pledged allegiance to ISIS and mentioned the Boston bombers, according to a U.S. official. 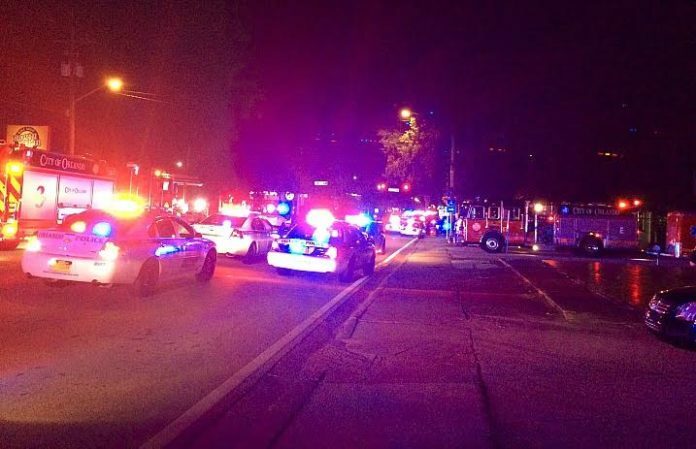 There are at least 49 dead and 50 more injured in the LGBT Orlando nightclub shooting, and Orlando Mayor Buddy Dyer has declared a state of emergency for the city after Sunday morning's terrorist attack. This is the worst mass shooting in U.S. history. Police said one of their main focuses right now is getting information to loved ones. Family members are urged to call city's crisis hotline at 407-246-4357. Following the attack, the city is in dire need of blood donations. Anyone who can donate is urged to contact a local blood bank. Warped Tour founder Kevin Lyman urged fans near Orlando make a donation. Police report the suspect had a handgun and AR15 type rifle, the same gun used in mass shootings at Sandy Hook and in San Bernardino. A suspected terrorist shooting at an LGBT nightclub in Orlando has left at least 20 people dead and more than 40 injured, according to police. The attacker was killed following a hostage situation at the club. Sources have confirmed to CBS News that authorities are investigating whether the suspect, who has been named as 29-year-old Omar Mateen of Port St. Lucie, had ties to Islamic terrorism. Mateen is a U.S. citizen with no apparent criminal history, according to sources. The suspect took scores of people hostage overnight inside the nightclub between 2 and 5 a.m. Sunday morning in what investigators are calling an act of domestic terrorism. He was carrying an assault rifle, a handgun and was possibly wearing an explosive “device,” police said in a press conference this morning. Kenneth Melendez, who was at the club when the shooting happened, told the Orlando Sentinel four of his friends were shot and were taken to an area hospital. “It's just something that you see in the movies but never think would happen to you,” he told the newspaper. The Federal Bureau of Investigation is leading the investigation. An FBI spokesperson said investigators can’t rule this out as an act of domestic terrorism and that the suspect, who is not from Orlando, may have leanings toward extreme Islamic ideologies. Police said the situation is not related to Friday night’s shooting inside The Plaza Live theater in Orlando, where a man opened fire, killing former The Voice contestant Christina Grimmie and himself. Next articleQUIZ: How well do you know the lyrics to “Misery Business”?